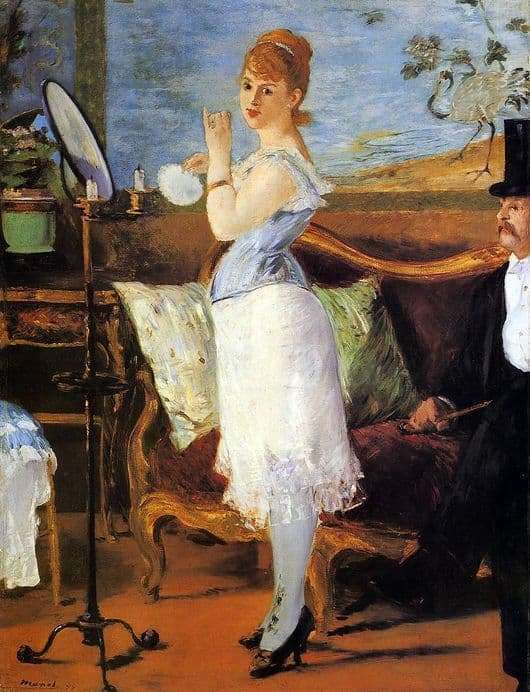 According to A. Proust, Edouard Manet was endowed with amazing sharp-sightedness, he extracted a lot of unusual observations from ordinary city walks, the capital of France no longer knew such flanders. In 1876, the artist was completely absorbed in thoughts about the Salon, and only thought about his exhibition. The author easily wrote the streets of Paris, cafes, portraits, naked women, etc.. It was this spectacle and the style of the author that attracted many new innovators. The same year, at the exhibition, the artist decided to submit to the jury the painting “Nana” – the toilet of half-light ladies. Many viewers believe that the canvas painted in the style of impressionism, but the author himself does not think so! A very interesting fact is that the image in the picture is inspired by thoughts about the cases of Mary of an intimate nature, although he did not draw it. The model’s creator was Henrietta, who was a famous woman of that time. She was also the mistress of the Prince of Orange. The painting depicts a woman of easy virtue in a satin blue shirt and white shirt. The artist chose this name to his spectacular work of art because Nana was the most famous name among women of this type. The Creator very well showed her fervent physiognomy, flexible waist, because behind him was waiting for the gentleman with a cane in an elegant suit and top hat. On this canvas, Manet shows how much the experience he gained during his travels and teachings changed him, he perfectly learned the lessons of impressionism. But the artist made it clear that this lesson immediately assimilated and created his new method, he adjusted impressionism to his method. That is why, when Manet tried to assign the title of impressionist, he reacted very sharply! In all the years of his work, Edouard Manet has created many creations. He uniquely depicted portraits, amazing poses of figures and their movements. All this captured unusual strokes. In the artist’s canvas, it is easy to read the psychology of the picture, to feel the artist himself. The creator could only a couple of strokes to convey to the viewer the character and condition of the hero.